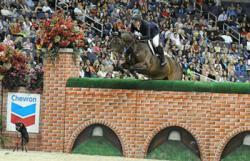 The 2009 Washington International Horse Show at Verizon Center - Blackburn Architects, P.C. : Blackburn Architects, P.C. Once again, the Washington International Horse Show hits DC –and believe me, horses stabled on the streets just outside the Verizon Center, home of the Washington Capitals and major concert events like Bruce Springsteen, cause quite a scene. Still, it’s a welcome scene and a great event that I look forward to attending. This year’s show features the Canadian Olympic dressage team’s Ashley Holzer who will perform with her horse, Pop Art, during the evening shows Thursday through Saturday. (Ashley and her husband Rusty Holzer, who is also a former Olympian, teach riding lessons at the Riverdale Equestrian Centre in Riverdale, New York, by the way.) 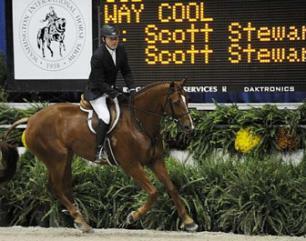 Saturday’s evening show also features the $100,000 President’s Cup Grand Prix, one of the main events at the WIHS. Are any of you planning to attend? The events kick off tomorrow–Tuesday, October 20th at 7 a.m. and run through Sunday, October 25th. Tickets are still available through Ticketmaster. I would have loved to seen the events at the WIHS but unfortunately I was on holiday until yesterday and it sounds such fun. Did you take any pictures while you were there blackburnarch, if so can you post them up! Many Thanks. Long story short: my camera broke! Although, there were plenty of photographers at the event (I noticed one had his flash hooked up to one of the arena’s lights for a BIG FLASH) who definitely will end up with better shots than I could ever come up with. Another great moment to have captured was on Thursday night, when one of the terriers got a hold of the fox tail! The owner was practically holding the dog upside-down and still couldn’t wrestle it out of his jaws. Hi John! glad I visited your blog today! I just finished a commission for Ashley’s team mate Jacquie Brooks, Gran Gesto, page is up on my blog right now, if you get chance! keep up the awesome work and congrats on your publication on the converted barn! stunning!! Take a moment to look at what a great show it was and marke on your calendar for the last week in October when an even bigger and better show will return to DC. Spread the word and take a moment to look at some great action photos of why you should plan to attend next year. Thanks for sharing the link to your photos. Probably best that my camera was broken since all the professional images put mine to shame anyhow. Excellent work. Be sure to say hi if you come next year. We are also organizing a group called Team WIHS and maybe you’d like to join. It’s for those who care about the show to help spread the word by writing something on their blog, emailing to their mailing lists, passing out brochures or doing anything you can to spread the word to get out and support the show. Much thanks for your kind words so far. And if you or anyone else would like to join our team, email me (Diana) at media@wihs.org.